Stand Watie (December 12, 1806 – September 9, 1871; also known as Standhope Uwatie, Degataga (Cherokee: ᏕᎦᏔᎦ), meaning “stand firm”, and Isaac S. Watie) was a leader of the Cherokee Nation and a brigadier general of the Confederate States Army during the American Civil War. He commanded the Confederate Indian cavalry of the Army of the Trans-Mississippi, made up mostly of Cherokee, Muskogee and Seminole, and was the final Confederate general in the field to surrender at war’s end. Watie was born in Oothcaloga, Cherokee Nation (now Calhoun, Georgia) on December 12, 1806, the son of Uwatie (Cherokee for “the ancient one”), a full-blood Cherokee, and Susanna Reese, daughter of a white father and Cherokee mother. He was named Degataga. According to one biography, this name meant “standing firm” when translated to English. He combined his Cherokee and English names into Stand Watie. His brothers were Gallagina, nicknamed “Buck” (who later took the name Elias Boudinot); and Thomas Watie. They were close to their paternal uncle Major Ridge, and his son John Ridge, both later leaders in the tribe. By 1827, their father David Uwatie had become a wealthy planter, who held African-American slaves as laborers. After Uwatie converted to Christianity with the Moravians, he took the name of David Uwatie; he and Susanna renamed Degataga as Isaac. In his life, Degataga preferred to use a form of the English translation of his Cherokee name, “Stand Firm.” Later, the family dropped the “U” from the spelling of their surname, using “Watie.” Along with his two brothers and sisters, Stand Watie learned to read and write English at the Moravian mission school in Spring Place, Cherokee Nation (now Georgia). One source (Franks, Kenny A. Encyclopedia of Oklahoma History and Culture. “Stand Watie”) states that Stand Watie married four women: Eleanor Looney, Elizabeth Fields, Isabella Hicks, and Sarah Caroline Bell. His child with Elizabeth Fields was stillborn in 1836. He and Sarah Bell married in 1842. They had three sons and two daughters, but there were no grandchildren. Watie became involved in the dispute over Georgia’s repressive anti-Indian laws. After gold was discovered on Cherokee lands in northern Georgia, thousands of white settlers encroached on Indian lands. There was continuing conflict, and Congress passed the 1830 Indian Removal Act, to relocate all Indians from the Southeast, to lands west of the Mississippi River. In 1832 Georgia confiscated most of the Cherokee land, despite federal laws to protect Native Americans from state actions. The state sent militia to destroy the offices and press of the Cherokee Phoenix, which had published articles against Indian Removal. Believing that removal was inevitable, the Watie brothers favored securing Cherokee rights by treaty before relocating to Indian Territory. Watie and his older brother Elias Boudinot were among the Treaty Party leaders who signed the 1835 Treaty of New Echota. The majority of the Cherokee opposed removal, and the Tribal Council and Chief John Ross, of the National Party, refused to ratify the treaty. In 1835, Watie, his family, and many other Cherokee emigrated to Indian Territory (eastern present-day Oklahoma). They joined some Cherokee who had relocated as early as the 1820s and were known as the “Old Settlers”. After removal, members of the Cherokee government carried out sentence against Treaty Party men for execution; their giving up tribal lands was a “blood” or capital offense under Cherokee law. Stand Watie, his brother Elias Boudinot, their uncle Major Ridge and cousin John Ridge, along with several other Treaty Party men, were all sentenced to death on 22 June 1839; only Stand Watie survived. He arranged for his brother Elias’ children to be sent for their safety and education to their mother’s family in Connecticut; their mother Harriet had died in 1836 before the migration. In 1842 Watie encountered James Foreman, whom he recognized as one of his uncle’s executioners, and murdered him. This was part of the post-Removal violence within the tribe, which was close to civil war for years. Ross supporters executed Stand’s brother Thomas Watie in 1845. At least 34 politically related murders were committed among the Cherokee in 1845 and 1846. 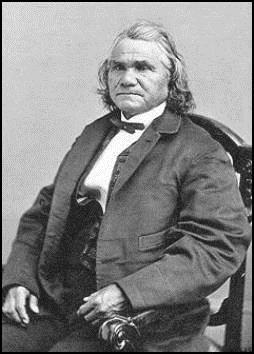 In the 1850s Stand Watie was tried in Arkansas for the murder of Foreman; he was acquitted on the grounds of self-defense. His nephew Elias Cornelius Boudinot, who had returned to the West and become a lawyer, defended him. Watie, a slave holder, developed a successful plantation on Spavinaw Creek in the Indian Territory. He served on the Cherokee Council from 1845 to 1861, and part of the time served as Speaker. After John Ross fled to Federal-controlled territory in 1862, Watie replaced Ross as principal chief. Watie was one of only two Native Americans on either side of the Civil War to rise to a brigadier general’s rank. The other was Ely S. Parker, a Seneca who fought on the Union side. Fearful of the Federal Government and the threat to create a State (Oklahoma) out of most of, what was then, the semi-sovereign “Indian Territory”, a majority of the Cherokee Nation initially voted to support the Confederacy in the American Civil War for pragmatic reasons, though less than a tenth of the Cherokee owned slaves. Watie organized a regiment of cavalry. In October 1861, he was commissioned as colonel in the 1st Cherokee Mounted Rifles. Although he fought Federal troops, he also led his men in fighting between factions of the Cherokee and in attacks on Cherokee civilians and farms, as well as against the Creek, Seminole and others in Indian Territory who chose to support the Union. Watie is noted for his role in the Battle of Pea Ridge, Arkansas, on March 6–8, 1862. Under the overall command of General Benjamin McCulloch, Watie’s troops captured Union artillery positions and covered the retreat of Confederate forces from the battlefield after the Union took control. However, most of the Cherokees who had joined Colonel John Drew’s regiment defected to the Union Side. Drew, a nephew of Chief Ross, remained loyal to the Confederacy. In August 1862, after John Ross and his followers announced their support for the Union, went to Fort Leavenworth, the remaining Southern Confederate minority faction elected Stand Watie as principal chief. After Cherokee support for the Confederacy sharply declined, Watie continued to lead the remnant of his cavalry. He was promoted to brigadier general by General Samuel Bell Maxey in 1864. He commanded the First Indian Brigade of the Army of the Trans-Mississippi, composed of two regiments of Mounted Rifles and three battalions of Cherokee, Seminole and Osage infantry. They fought in a number of battles and skirmishes in the western Confederate states, including the Indian Territory, Arkansas, Missouri, Kansas, and Texas. Watie’s force reportedly fought in more battles west of the Mississippi River than any other unit. Watie took part in what is considered to be the greatest (and most famous) Confederate victory in Indian Territory, the Second Battle of Cabin Creek, which took place in what is now Mayes County, Oklahoma on September 19, 1864. He and General Richard Montgomery Gano led a raid that captured a Federal wagon train and netted approximately $1 million worth of wagons, mules, commissary supplies, and other needed items. Since most Cherokee were now Union supporters, during the war, General Watie’s family and other Confederate Cherokee took refuge in Rusk and Smith counties of east Texas. The Cherokee and allied warriors became a potent Confederate fighting force that kept Union troops out of southern Indian Territory and large parts of north Texas throughout the war, but spent most of their time attacking other Cherokee. On June 23, 1865, at Doaksville in the Choctaw Nation, Watie signed a cease-fire agreement with Union representatives for his command, the First Indian Brigade of the Army of the Trans-Mississippi. He was the last Confederate general in the field to surrender. After the war, Watie was a member of the Cherokee Delegation to the Southern Treaty Commission which renegotiated treaties with the United States. During the American Civil War and soon after, Watie served as Principal Chief of the Cherokee Nation (1862–1866). By then, the majority of the tribe supported the Confederacy. A minority supported the Union and refused to ratify his election. The former chief John Ross, a Union supporter, was captured in 1862 by Union forces. John Ross, Cherokee Chief, had signed an alliance with the Confederacy in 1861, but repudiated it two years later. He reflected the shifting support within the Cherokee Nation, although by then a majority favored the Confederacy. After he was captured by Union forces and ended up in Washington, D.C., Tom Pegg took over as principal chief of the pro-Union Cherokee. Following Lincoln’s Emancipation Proclamation in January 1863, Pegg called a special session of the Cherokee National Council. On February 18, 1863, it passed a resolution to emancipate all slaves within the boundaries of the Cherokee Nation. Most of the “freed” slaves were held by masters who were part of the pro-Confederate Cherokee, so they did not gain immediate freedom. Stand Watie was elected principal chief of the pro-Confederate Cherokee, who increasingly outnumbered pro-Union elements. Ross’ supporters, by then in the minority, refused to recognize his election. Open warfare broke out between the “Union Cherokee” and the “Confederate Cherokee” within Indian Territory. After the Civil War ended, both factions sent delegations to Washington, DC. Watie pushed for recognition of a separate “Southern Cherokee Nation”, but never achieved that. Watie led the Southern Cherokee delegation to Washington after the war to sue for peace, hoping to have tribal divisions recognized. The US government negotiated only with the leaders who had sided with the Union, and named John Ross as principal chief in 1866. The US government refused to recognize the divisions among the Cherokee. As part of the new treaty, it required the Cherokee free their slaves. The Southern Cherokee wanted the government to pay to relocate the Cherokee Freedmen from their lands. The Northern Cherokee suggested adopting them into the tribe, but wanted the federal government to give the Freedman an exclusive piece of associated territory. The federal government required that the Cherokee Freedmen would receive full rights for citizenship, land, and annuities as the Cherokee. It assigned them land in the Canadian addition. In the treaty of 1866, the government declared John Ross as the rightful Principal Chief. The tribe was strongly divided over the treaty issues and return of Ross. He died in 1867 and a new chief was elected, Lewis Downing, a full-blood and compromise candidate. He was a shrewd and politically savvy Principal Chief, bringing about reconciliation and reunification among the Cherokee. Tensions lingered into the 20th century, but the Cherokee did not have the extended insurrection among pro-Confederate forces that occurred in the South. Shortly after Downing’s election, Watie returned to the nation. After the treaty signing, he had gone into exile in the Choctaw Nation. Under the new treaty, he tried to stay out of politics and rebuild his plantation. He returned to Honey Creek, where he died on September 9, 1871. He was buried in the old Ridge Cemetery, later called Polson’s Cemetery, in what is now Delaware County, Oklahoma, on September 9, 1871. He was a citizen of the Cherokee Nation. Watie’s grave stone on Find-A-Grave. This entry was posted in Cherokee, Choctaw, Military, Muscogee, Osage, Seminole. Bookmark the permalink. What was the relationship of Waite to the Choctaw and Chickasaw Mounted Rifles – a part of the Confederate forces made up of men from the two Nations as in the name????? I can tell more about how my Father-in Law was from reading the above article. A.B. Gillies, born in Prior, Oklahoma in 1919, also served in the US. Army with General George S. Patton. He was a prejudiced man. Albaiser Baxter Gillies, Congregational Methodist Minister, died in March, 1991.A.B. was at least half-Cherokee,if not more. Thank you sir, for your service to the Confederacy and to the Cherokee people. I know us white men and women did a lot of bad things, and terrible things to American Indians through out the years. I would like to apologize, if I may for all that.